Info, Reasons, Pics, Comedy, and the added plus of plenty of new Cuban slang words, to follow shortly. If the title is not proper for LSP, Mods Please let me know, and I will try to be less colorful!! I'm so going to be watching this one. I talked to Russ about this a few times. He was always keen and supportive of the idea. And darn if it won't look great. Sounds really cool Alfonso - Can't wait to see how this one turns out? (I wonder what 'P-' number would have been allocated to it had such a beast really existed? ). Too cool! This is just what the doctor ordered. How about a night fighter version??? 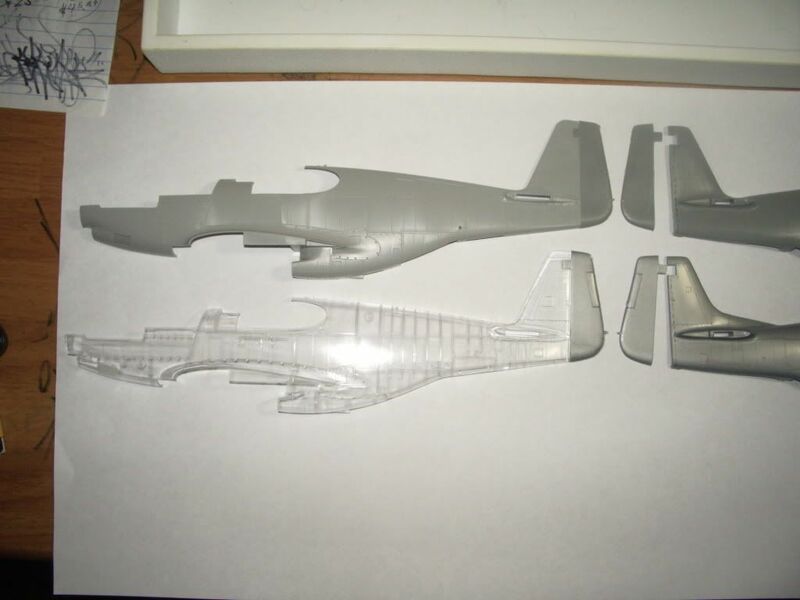 @ ScanmanDan - It was in the build thread of your Revell P-51B that Russ, and yourself mentioned the interest in such a "What If", and re-sparked my interest in this, obviously "shared" by others, idea yet again. I have dreamed about building this possibility since I was a teenager in the late '80's. I will try to do my best in Honor of Russ's memory. I have "liberated" your photoshoped top-view rendition from your thread, and will be using it as my "plan", so to speak, of what I wish it to look like. I hope that it's cool with you, that I have borrowed your image? I also am wondering what you, and Russ came up with, as I would Love to know??? 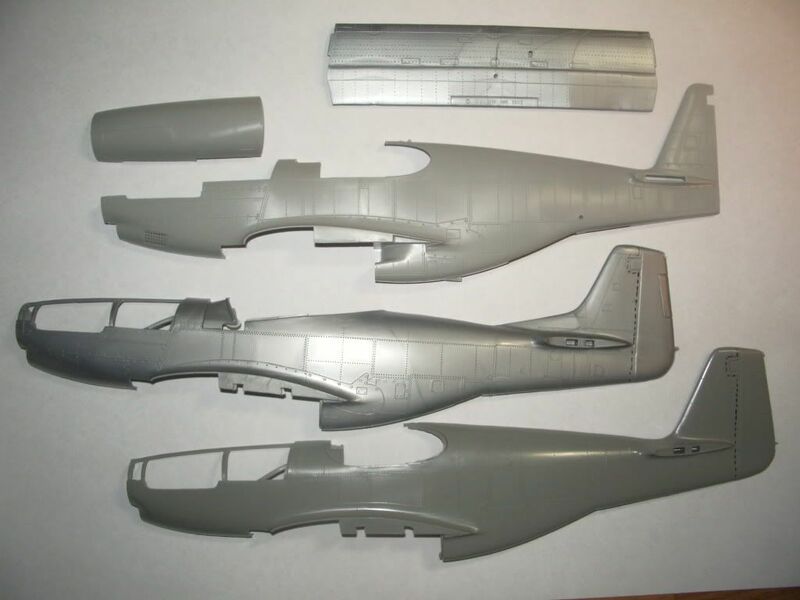 You, and Russ are so right, in that a P-51B fuselaged "twin stang" will look great. I also Pray, that I can do it justice, for Russ, yourself, and all those who have had a similar vision. Thanks, for looking in! 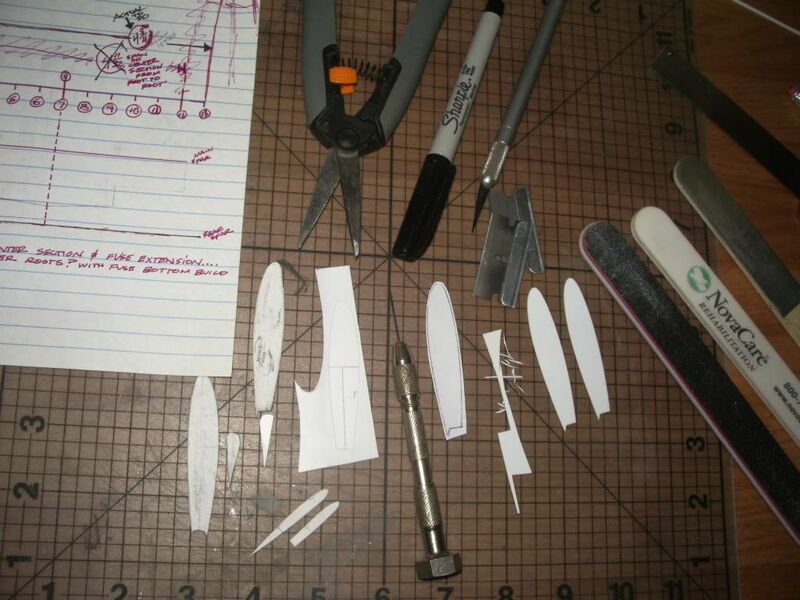 1- Over all view of what I'll be using/cutting up for the exterior, Trumpy , -B fuselages(X2), and -B wings . Hasegawa, -D control surfaces. 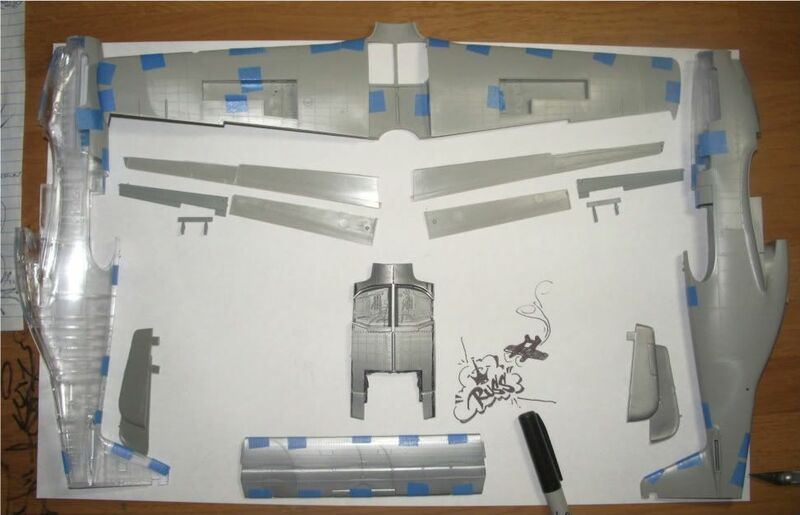 Revell, -D lower wing front, the piece that transitions the fuselage to wing, and the rudders from a -D, and -B. 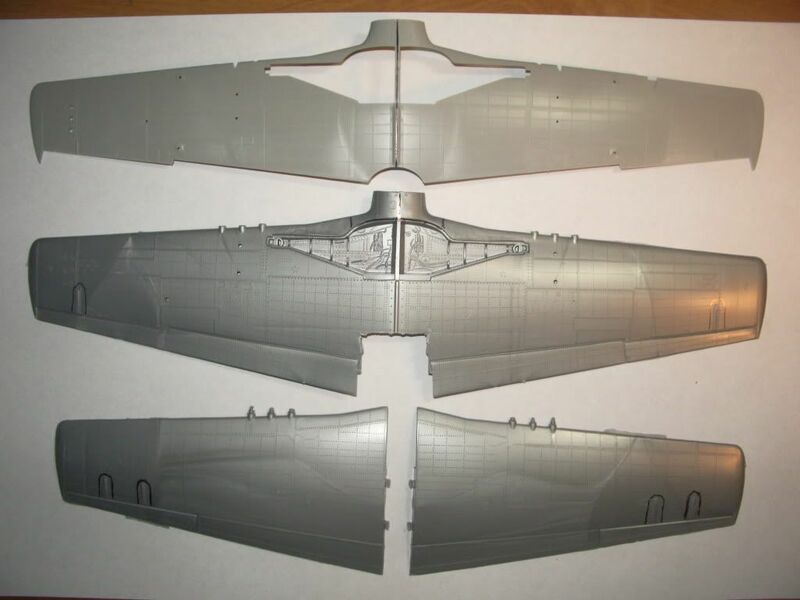 Also from Revell, I'm gonna be using the P-38 horizontal stabilizer as a template for what else, but a horizontal stabilizer. 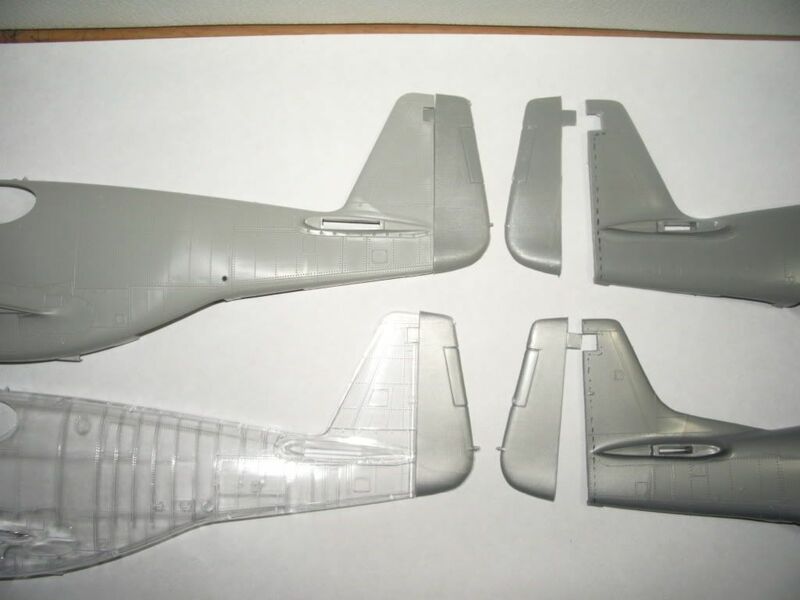 2- I have to cut the Rudders off the Revell P-51B, and -D, as I have no rudders in the parts I bought from Larry. I will pretty much have to cut all 3 Mustangs up in someway or another to get what I need. 3-Trumpy -B lower wing to be cut in half. Revell -D wing showing forward transition area that needs to be removed, to be grafted later on for the new transition to the center section . 4- Hasegawa control surfaces to be removed since I don't have any other option. This is gonna be a kit bash/scratch-a-thon if you can't tell already. I can hear Russ laughing now, while eatin the best pudding cups Zion has to offer, this one's gonna be some FUUUUUUUUN!!! Great choice for a project Alfonso! Looks like you've done a lot of thinking and planning for it already. Looking forward to watching you carry it off. @ Mattlow, Thanks, and "Wow" is right!!! That's what I've been saying thru the short planning, and now cutting stages of this "What if" invention. 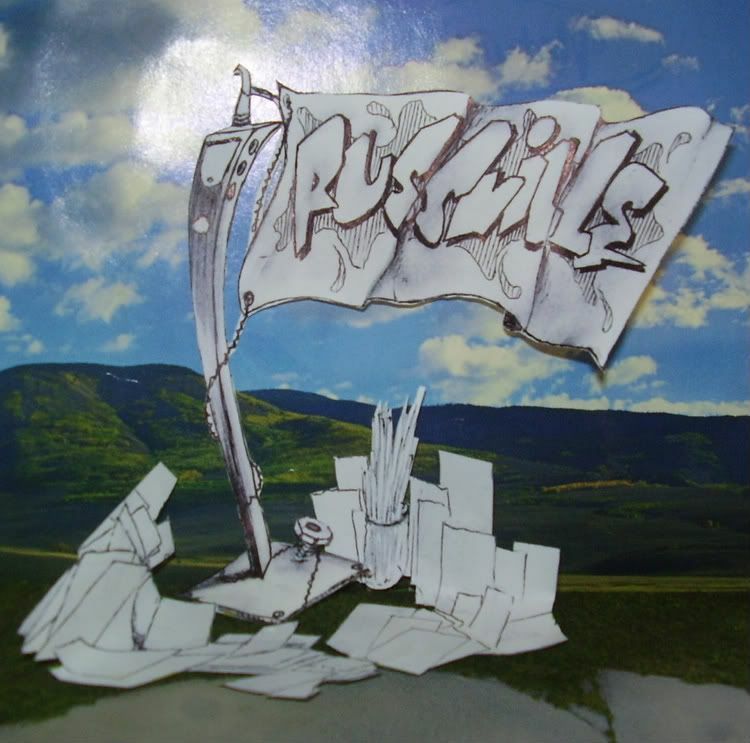 But, for Russ, I shall spin along, in song, with Funk 33 1/3 LP's, and 45's in the mix .... BTW-I still Dj vinyil records on turntables, and "Love" to use this emoticon when ever possible. @ Kevin, Thanks, I've always wanted to do this, and knowing that Russ had an interest in this also, made me step it up, just for him. 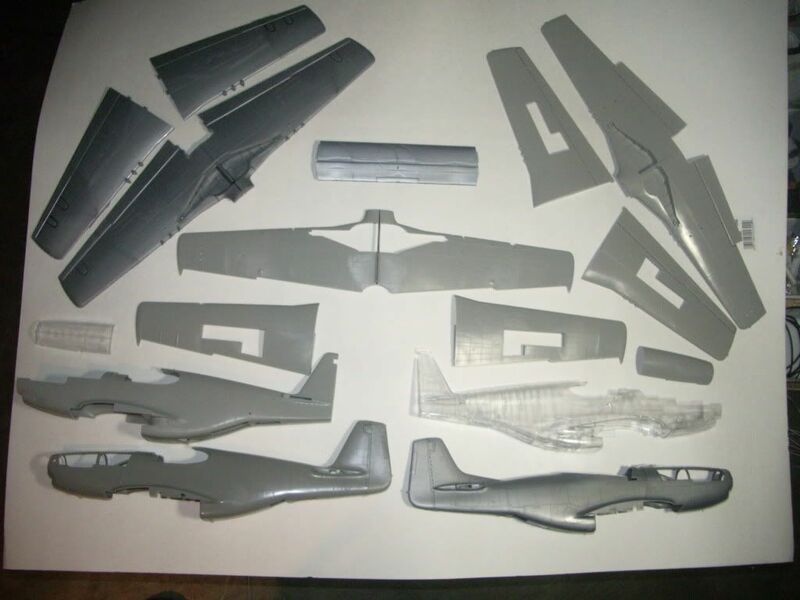 I bought all these P-51 bits, except the Revell -D, from Larry a couple a weeks ago. When they arrived, and I saw that I had multiple Trumpy -B fuselages, and 1 set of Trumpy -B wings, I was already thinkin, hmmmmm, it's on!. I only started planning it after the mention of his passing, in his honor, and memory, to be able to livicate him in some way. We'll see..
1- Rudders removed from the Revell -B, and -D. I would have preferred 2 Hasegawa rudders due to liking their shape better, but only had the Revell in a pair. Worked out as they ain't that far off, just too straight at the rear, if you know what I mean. 2- Close up of the rudders, just a bit a re-shaping and they'll do. 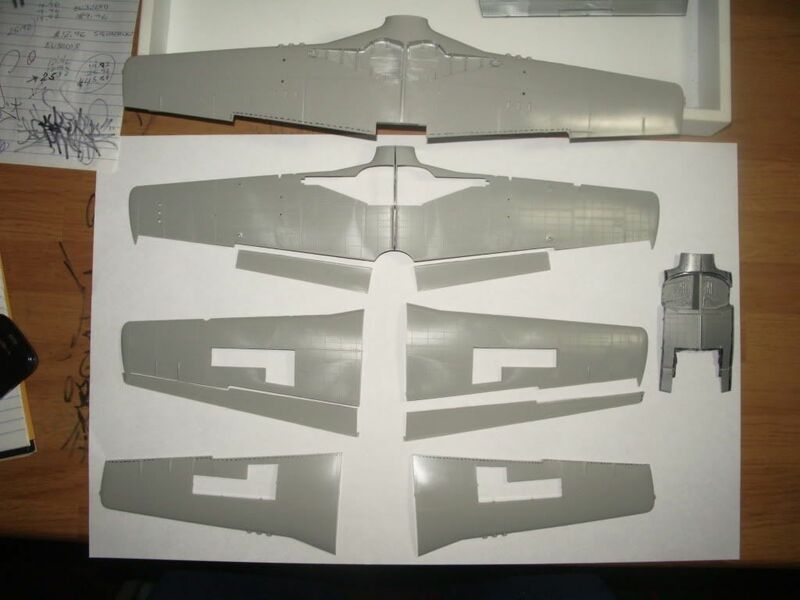 3- Flaps, and ailerons removed from Hasegawa wings. 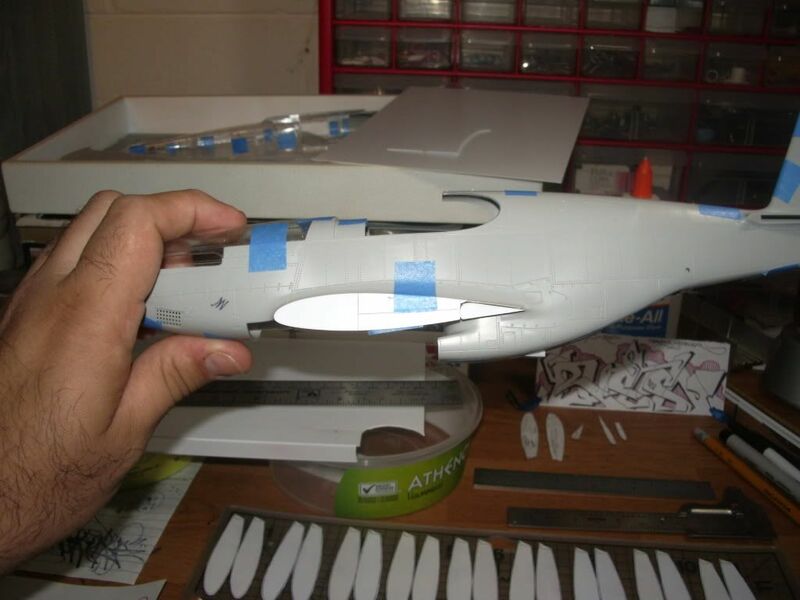 The ailerons need to be cut at their outer ends to fit the Trumpy wing.The flaps will need to be re-worked a bit to fit the trumpy wing, by reducing the leading edge of the lower halves. 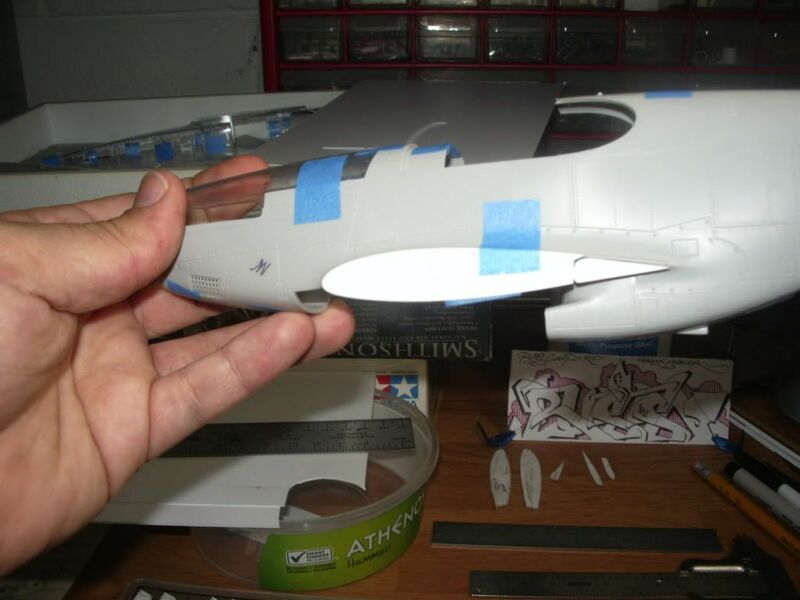 The center section from the Revell lower wing will be cut in half, from front to rear, then later attached to the inner fuselage halves, and blended into the scratch built center section. Forgot to post these pics last night, from the same set as above. 1- After makin a mess of all the kits, these are the parts that I will be using in the conversion. 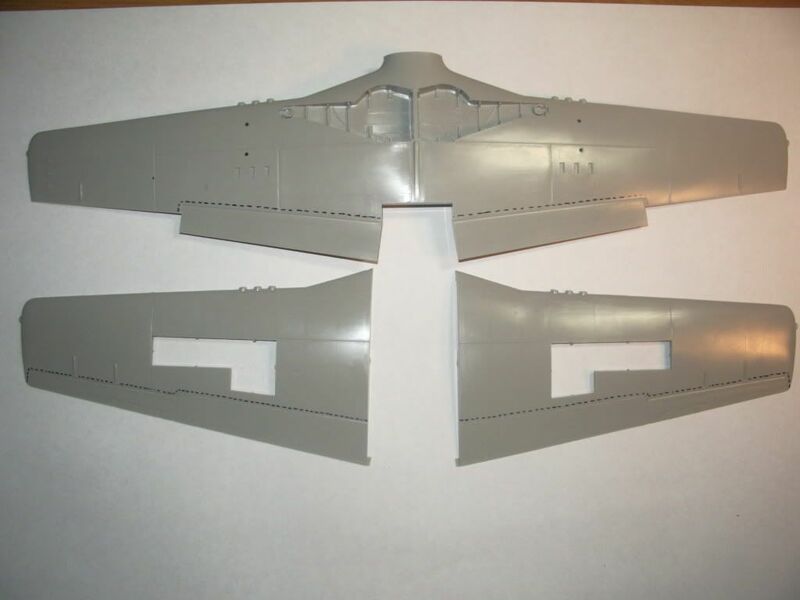 Maybe minus the Revell P-38 horizontal stabilizer, as I might just make my own. I found some Dragon ailerons in the parts bags I got from Larry, and am toying with the idea of throwing them in, after modifying them. I mean why not, this kit already got some Trumpeter, Hasegawa, and Revell. If not maybe just the trim tabs... time will tell. 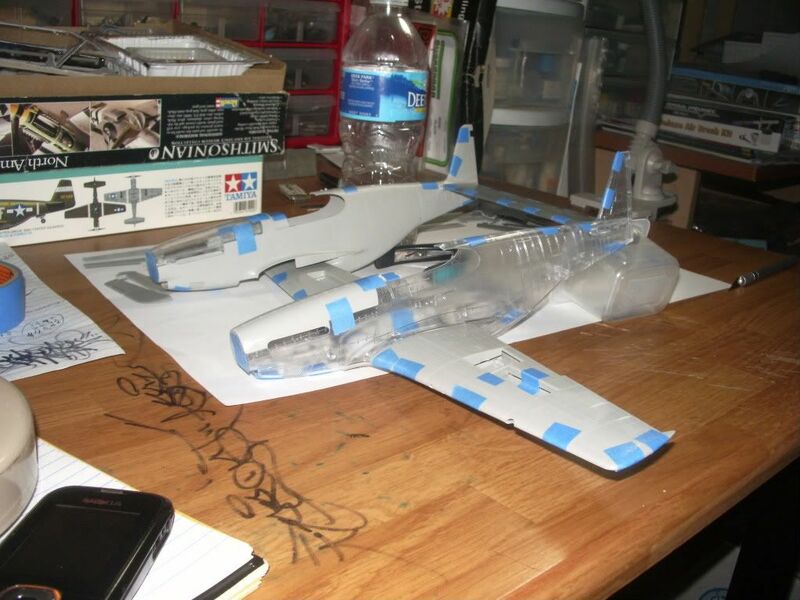 I still have to split the lower wing in half, and do the same to the Revell center section, to have that ready for transformation. 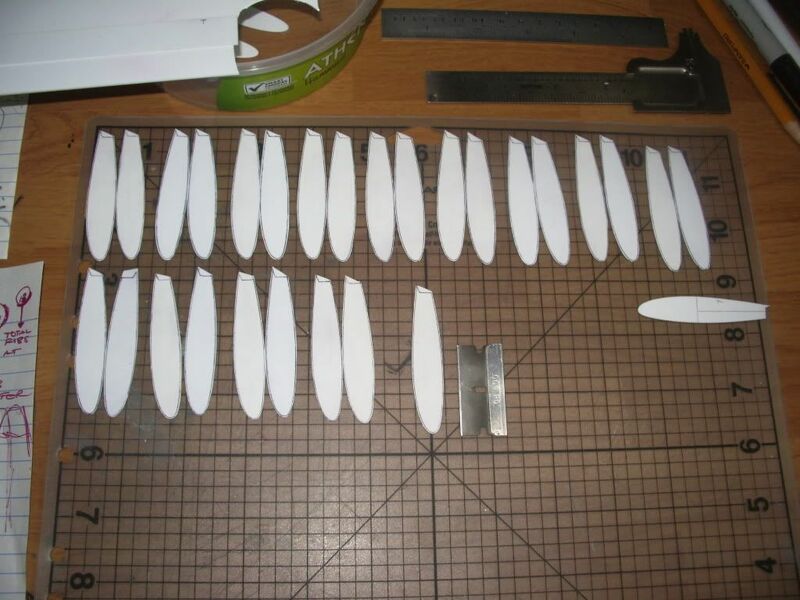 The rudders will be glued, and trued, as well as the ailerons, whichever I decide to use, and the flaps. Gotta make a wing root rib template, then copy it a bunch a times, to get the center section going, and while I'm at it I'll probably do the same for the horizontal stabilizer. I figure, hopefully anyway, that once I got my exteriors squared away, I can worry about the insides. The only exception will be planning the wheel bay as I build the center section. AHHHH, I can hear the Cuban slang words now.... "Le traquetea", translation- it rattles. Rattles what is left to the imagination... painful though. 2- A cheap thrill mock up, sorta more visual if you squint. 3- Cheep thrills mock up part 2. More as it progresses, Thanks. Since you mentioned that this is a "what if", why not do it as a mud mover, loaded with rockets and bombs? Now that would be cool! Thanks for looking in but, I don't know, as of yet, what role she will eventually be fitted in. Decisions, decisions, hmmm. I wish I knew what Russ would have liked to see her as??? I'll edit this later, I'm out to the park with the Family.... Thanks for looking in. I'm back from the park, so on with the edit.. This is just another cheap thrill mock-up pic, but with some measurements, and a lil' planning this time! 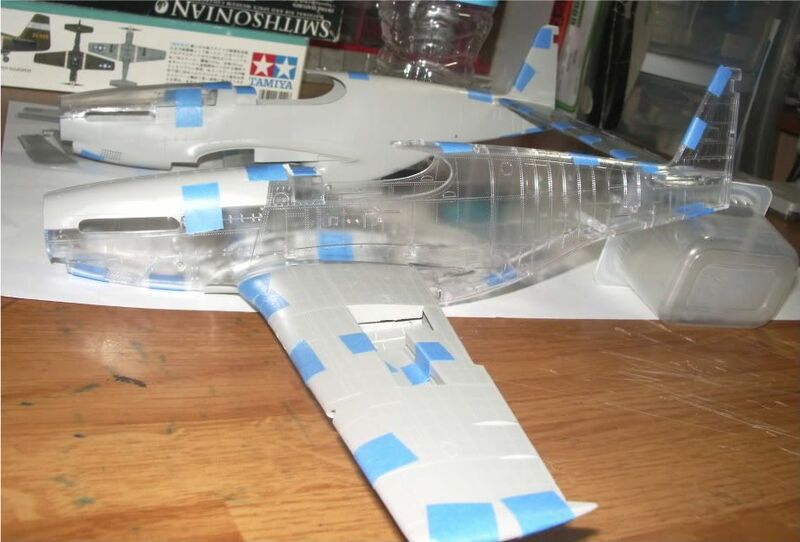 Just a rough to count, and space the ribs, and wheel bays out. The center section will be 4 3/4" wide. 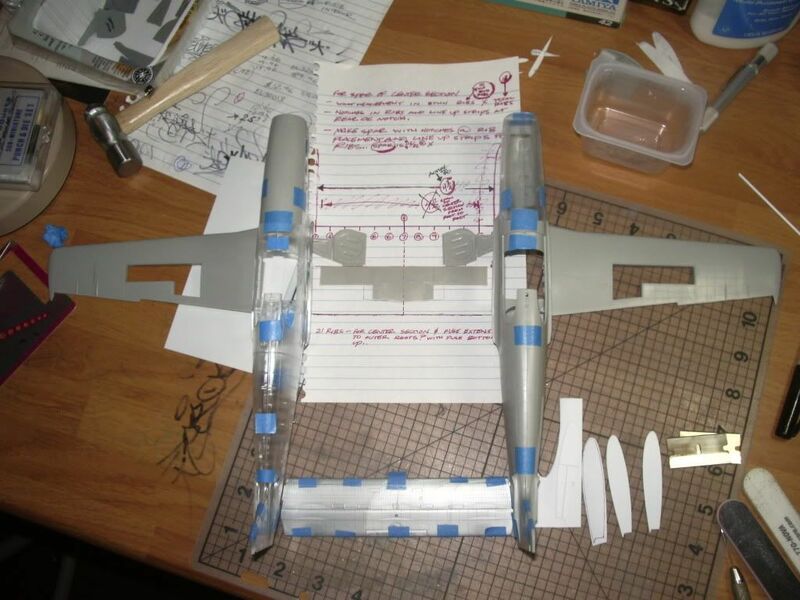 An overall view of how I went about making the wing ribs. Going from left, to right. 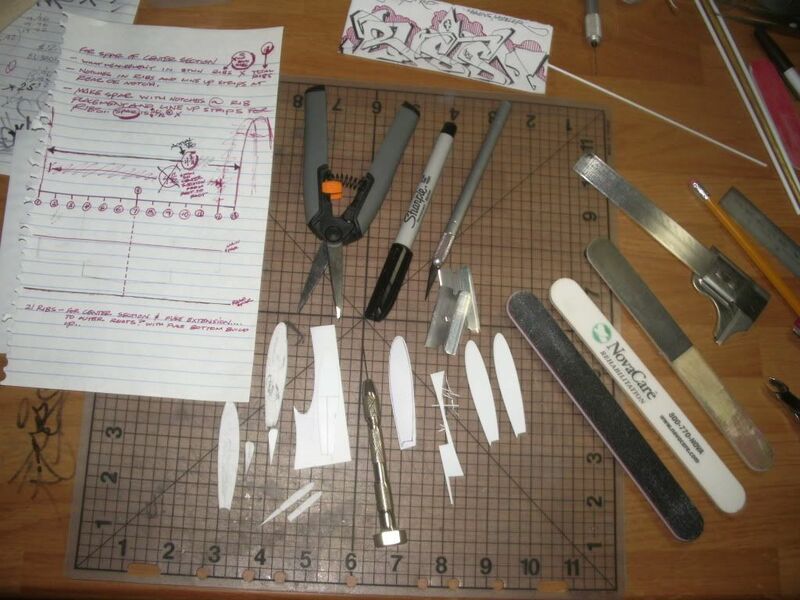 First, I made a pattern of the wing, and the horizontal stabilizer, root ribs by pressing it's shape into the paper I held tightly against the kit fuselage roots. I finished it off with plenty of, uhhh, ghetto certified scientific guess-ti-mations, and drew in the rest till it looked right, and fit. Make any sense?? I then white glued the paper pattern to styrene sheet, traced/scored it with a pin in a pin-vise to get it's outline, removed the paper pattern, and ink washed the scribed lined. Using the scissors I cut close to the final outline, and finished off trimming closer with the blades, and then finalized the shape with the sanding sticks. 5- Rib, and flap pattern check fit, and it fits....yessssssss.. I know there's a bunch of better ways of doing this, but I did with what I have... More ghetto building to come..
do you still need information on props?